Whenever I try a beer contracted to another brewery for a local market, most of the time I find that the original holds up better than the contracted brew (See: Dead Frog's Hops & Robbers IPA) but I still want to give it a run for its money as I love trying all beers and any beers. Back when I was in Quebec City in April, I was walking up and down the beer eisle at the Metro Plus on Charest and saw Blonde d'Achouffe in single bottles. Blonde d'Achouffe already exists here in Manitoba as simply La Chouffe. Blonde d'Achouffe is actually brewed on contract specifically for the Quebec market by Les Brasseurs RJ, which happens to be one of the largest breweries in all of Quebec, heck - they even recently bought out Moosehead's share of Brasseries McAuslan the same week as I bought this brewery, so yeah.. Les Brasseurs RJ have a significant stake on the Quebec beer scene. 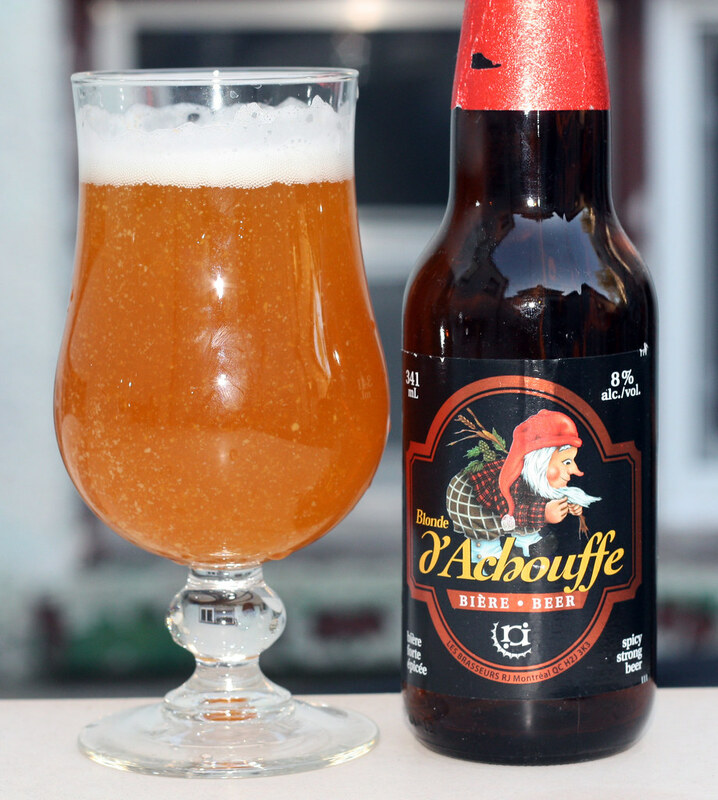 How does Les Brasseurs RJ's Blonde d'Achouffe compare to the original La Chouffe by Brasserie d'Achouffe? First let's review La Blonde d'Achouffe. Appearance: Blonde d'Achouffe pours a thick orangey blonde, a thick bubbly snow white head, INSANE amount of sediment floating around in the beer.. so much so that the sediment is actually floating up to the top. Aroma: Slightly syrupy, sweet, lots of Belgian yeast, a bit of an alcohol aroma. Not much really going on there, a bit light for an 8% Belgian Pale Ale. Somewhat fruity like apples, pears and coriander. Taste: I have a bad cold right now (Thanks Obama Roommate..) so it's kind of hard for me to nitpick so far. It's your standard Belgian Pale Ale with standard Belgian yeasts, a bit sweet and fruity, light amount of coriander, sweet to the tongue, a bit watery mouthfeel. Decent Belgian Pale Ale but needs to be a bit stronger. Appearance: Like La Blonde d'Achouffe, La Chouffe pours a thick golden orange, sediment isn't anywhere near as prominent in the original Belgian beer versus the Brasseurs RJ version, but it's there and going all over the place. Thick white head as well. Aroma: First off, a nice alcoholic aroma, more present than the Brasseurs RJ version, more coriander, not as syrupy but certainly more there than the Brasseurs RJ version. Notes of apples and pears again, more of it. Somewhat bready and parfumic. Taste: Like the Brasseurs RJ version, a solid Belgian Pale Ale, I'm getting a bit of a hint of iron first off, followed by the sweetness of fruits, coriander and a bit of breadiness. Certainly alcoholy tasting, a slight tinny bitterness for aftertaste and a thicker mouthfeel than the RJ version. Who wins? : Both are very solid Belgian Pale Ales, Les Brasseurs RJ did a good job capturing the essence of Brasserie d'Achouffe's popular ale, but like most beers, nothing compares to the original, BUT Brasseurs RJ did a very stellar job and I would NEVER say no to another one. The original is a bit more fruity while the Brasseurs RJ is a bit more coriander flavoured. There's a reason Les Brasseurs RJ is one of the largest breweries in Quebec, and it's not for producing mass amounts of piss water like Molson does, sure Les Brasseurs RJ brews the Tremblay line of beers, but they have even more delicious beers that beer geeks would enjoy!